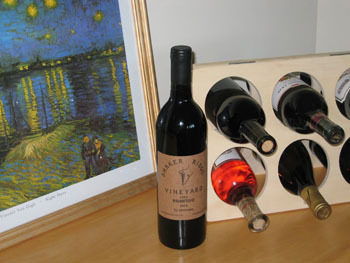 One of our first clients had the following (excerpted) to say about Shaker Ridge Vineyard. The full article can be found on Obscurity Cellar’s website here (pdf file; see “The Story of Primitivo”). “Andy and Elizabeth Standeven have developed a gorgeous vineyard called Shaker Ridge, with three acres each of Barbera and Primitivo grapes (and a few Port varieties they like to play with) in the El Dorado AVA at about 1500 feet of elevation. They are both scientists and bring the meticulousness of their scientific training to bear on the vines and the grapes they produce. Not only have they voluntarily limited the crop to the magic number of two tons per acre…but they insist on only picking the grapes when we’re satisfied they’re exactly ripe, and then will only deliver intact fruit in perfect condition. They inspect each cluster for any shrivel, mold or other Material Other than Grapes (“MOG”), and reject any that don’t meet their exacting standards. Andy posts weekly progress reports and chemistry measurements on his website, and provides full guidance for the wineries that purchase his grapes, allowing them unusual latitude in planning for the arrival of the fruit. “The result of all this attention to detail is wonderful fruit that we hope to turn into equally exquisite wines. We bought a sample ton of primitivo, since we’ve never made it before, and were so delighted with the wine that we bought another half-ton for Port when the grapes ripened to dessert wine sweetness….only a week after pressing, we were delighting in the aromas and flavors the grapes produced. We followed this a couple weeks later with three tons of Barbera from their vineyard; grown, picked and sorted with the same care, and it promises to be an equally terrific wine.